Many people in daily business life stay anonymous. The man who enters a store, takes a look around and then leaves stays anonymous. Nobody of the staff knows who he was. Nobody from that store will we able to contact him about their products. Ergo nobody from that store will we able to sell to him what he was looking for. On the internet a website may have thousands of visitors. But they stay anonymous. Even if statistics tools are in use, they only remain numbers and coordinates. As the owner of the website we do not have any real contact to turn to and talk about their interest in our website – or DO WE? Leads can change that anonymity and therefore benefit your business greatly. This is why smart businesses are looking for lead generation ideas. And the use of IDX solutions can help with generation of leads. In simple words: In marketing a lead is the data set (contact data) of person given of his/her own accord to a business owner. Leads take away anonymity and allow business owners to get in direct contact with a prospect or buyer. When the contact data is given to them by choice, it also shows that the person is really interested in their business and products, which enhances the chances of an eventual sale to this person. Note: In order to create a lead (successful contact), the business owner needs to know the real contact information of this person. As a business owner, people interested in your services or people who have already bought your products are the target audience for future business and sales. This is why lead generation ideas are an extremely interesting marketing tool for business owners and why they are worth taking some efforts of generating them. Leads can be generated in many different ways. People could sign up for newsletters or someone could request information about your services/products from you – always provided they do not stay anonymous, so you can contact them in the future. Why should I be interested in lead generation ideas? That sounds complicated and like a lot of work! It takes some time, some thinking and some efforts, sure. But lead building is a very sustainable way of building successful business relationships. In contrary to the means of lead generation there are indeed other ways of obtaining data of people. This data can be used to contact them with advertising. One way could be to simply buy one of those huge address databases, offered everywhere around. This is called “cold advertising”, as the prospects are not personally known. Sounds so easy, doesn’t it. So, where’s the catch, compared to lead generation? A lot of the advertising business owners undertake can be categorized as cold advertising. A lot of it also is entirely valid and acceptable, like for example placing banners or signs. Buying databases and use them to contact people, however, is actually a very aggressive form of cold advertising. It can even be illegal, because it may infringe the data protection rights of people. Secondly, as we are talking about cold advertising, the people in this database likely are not even aware that our business exists and what it is about. Nor do we know, if they need the services/ products offered by the business owner. Lastly it is uncertain, if they will feel repelled by being contacted without being asked. In the worst case scenario this way of advertising may rather leave a stain on our business than serving you with benefits. That is a lot of risk involved. Even more if you consider the fact that among this huge amount of “prospects” there will possibly only be a very small amount of customers actually valid for your business – unless you are selling mobile phones or other mass products. If you are offering some kind of niche product or services designed for a particular audience, this method is more like taking the sledgehammer to crack a nut. Bottom line: Many visitors on a website do not automatically generate sales as long as they stay anonymous. But even owning and using many addresses of many people does not necessarily bring one single additional sale, if these addresses were not given voluntarily and/or do not really resemble the target audience. Business owners have to act strategically with their business to reach the people who really seek and want what they are offering. This group is most likely to buy anything from them. Building trust and deep client relationships will lead to mouth-to-mouth recommendation and a high client retention rate. That can not be accomplished by spamming. 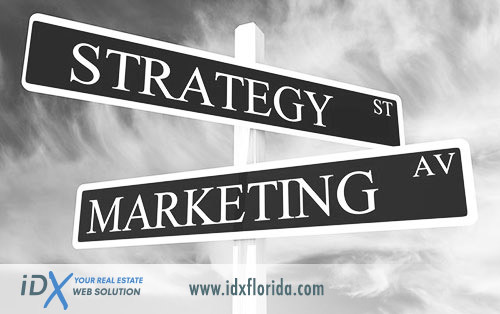 This is where lead generation ideas come in handy and where IDX solutions can be helpful. But how is it possible to make personal contact with anonymous visitors of my website on the internet? Let’s first think back to the man who entered a physical store and then left anonymously. What we experience in many stores today is the execution of lead generation ideas in practice. In many stores a clerk would actively address the man and introduce some of the current offers in a few words to him. So far he does not have a lead here. Also all he can conclude for now is that the man must be interested somehow, because he entered the store (provided he is not only looking for the restrooms). If the man responds by expressing his interest in a certain product, this could lead to a sale. During that sale many stores will encourage the man to leave his data and consent to receive future advertising. This way the store does not only generate a first sale, but already makes the first step towards future sales to this person. There are other ways of obtaining the personal data of this prospect without an immediate sale. For example, inviting him to enter into a sweepstake (where of course he has to leave his data), sign up for information via e-mail, become a member of the store’s discount program or sign up for a store card. Translated to the internet the first and foremost step for business owners is to present themselves and their business properly. They need to have an up-to-date website online with good information pointing out exactly they have to offer. This website needs to be properly optimized for the search engines as well as for human visitors and needs to use the right keywords. Ideally these business owners will also be active in some Social Media Networks to spread the word even more effectively. If all that is done correctly, prospects and customers will be able to find them and their business, when they look directly for it OR if they do not know it yet, when they look for such services/ products in the search engines. But business owners and their staff do not meet the people who visit their website in person. Why look for lead generation ideas and not just rely on my website and the big “CONTACT” button in the upper right corner? Sure, that is one way to go. But think about it. You may have thousands of visitors on your website each month, because you really did your homework with optimizing. Also you present very informative content. Yet your website does not generate a single sale or contact. All these people walk by right in front of your business without you getting the chance of selling anything to them. You can now just wait to get lucky – OR actively do something to enhance the chances of creating a contact leading to a sale: By using some of the lead generation ideas below. As a real estate agent your options for hosting a sweepstake will probably be limited. You would certainly not want to advertise a new house as first price – although this pretty sure would create some interest in people and attract a lot of leads. But joking aside, the Internet has actually opened up a whole variety of possibilities for lead generation. There are so many ways that explaining them all would go beyond the scope of this article. In case you have obtained your new website from us, we will probably have already talked about the importance of optimizing a website vs. just BEING on the internet. Focussing on narrowing it down to the exact keywords and content that best describes your services/ product/ niche helps to promote your business and target exactly the audience you desire to reach to generate sales. Spreading will only spread your audience as well and give the search engines a hard time to decide how to categorize you appropriately. This can even lead to undesired categorizing or exclusion from the catalog. But not only the search engines are important. At least equally important is the user experience on your website. Optimizing websites only for search engines can lead to an unnatural read & feel of the content. This kind of content will rather repel people than attract to read and browse it. Usability and real information are the foundation of your successful website. We offer different levels of SEO services for your real estate website. If you are interested in these services, just talk to us. Many people are not aware of that, but copying and using text without permission or at least naming the source in many cases actually is a copyright infringement. Text is also counted as intellectual property. But that is not even the main problem when we speak of possible disadvantages for your business. Neither the search engines, nor people are dumb. The algorithms of search engines are able to identify copied content (of course they can, they “see” thousands of websites each day) and even determine, which one of the duplicated versions is likely the original. Being identified as the one, who copied the content, can lead to downgrading of your website or in the worst case exclusion from the catalog. The reason behind this is simple: The search engines want to present GOOD and unique information. They do not intend to make people read the same information on different sites over and over again, because that simply does not make any sense in the process information gathering. Also website visitors do not want to read the same story over and over again. Therefore duplicated content is mostly undesirable on your website and only acceptable in certain cases. That does not necessarily have to keep you from presenting information that already exists on the internet on your website in order to make it accessible to YOUR OWN website visitors. Only in this case use your own words, write your own content based on the existing information, and perhaps add your point of view or personal advice to make it unique and turn it into a real additional value for the reader. The search engines and your readers will appreciate it. What does all this have to do with lead generation? Well, content that shows your expertise in the field gives you a means of presenting yourself to your audience as a competent provider and enhances your chances of being contacted (to create leads). When you hold valuable information and unique content available on your website, it is not unethical to ask the reader to give something in exchange. He will be willing to do so, if he is really interested in your services/ products. His consent to give information at the same time fortifies his interest, while enhancing your chances of getting/ staying in contact. with a popup to sign in in order to view the contents of your website a few seconds after they have entered your landing page. This is a fairly aggressive way, but you will find it on many websites. A more subtle way is to allow the visitor to browse your content for a while and THEN invite him to register, if he wants to continue. Another way is to only hold certain features ready behind a registration and offer that as soon as the visitor shows interest in those particular features. In real estate with IDX, for example this could be a bookmarking feature for favorite listings offered in exchange for a registration. Other calls for action or ways of visitor retention are, for example, live chats sliding into the page, popping up contact forms or Q&A tools. These are lead generation ideas, which all bear the potential of becoming actual leads, if used the right way. Once you have decided which lead generation ideas you want to use to collect personal data from your visitors, you should use them for for your lead generation. Newsletters are a great way to keep in touch with your prospects and clients and inform them about your general activities, products and news. You can either request the consent for receiving newsletters with the call for registration on your website or you can offer a separate newsletter registration. Your newsletters should be sent out frequently, but only when there is useful information existing worth telling your readers. They should be crisp (not include pages over pages of text) and include images for easier orientation. If you want to produce a frequent newsletter, we are able to help you with the setup of a design resembling your current website and also with the entire execution of the mailing process. This part of your website is more important than you may assume. This is where many people meet you the first time. Development of trust and the personal relationship start here. Therefore do not make it cloddish, but still personal. Show a picture of yourself. But in real estate, please, no vacation shots. Be serious. Choose a meaningful headline, describing who you are in crisp words. The more information you have to present on yourself, the more it should be broken down into manageable chunks. Last but not least, as contacts are what your are looking for, actively encourage people to contact you by placing a warm invitation and all the necessary data. Why let them search for the “contact” button, when they can have your information right there. If you need help with determining what you should present about you on your “About” page and how to present it on the new real estate website we build for you, just ask us. We will be happy to help with advice. Blogs are a great way to retain visitors and initiating leads. They are a great way to lay out your expertise and present really valuable information to your audience without stuffing other parts of your website to the edges with text. Short or long does not matter in a blog post, as long as the content comes frequently, is rich in information and unique (see point 2.). Your advantage from a Blog: People are more likely to contact you, when they have a chance of “getting to know you” a little bit in advance through a blog. We can integrate a blog into your professional WordPress-based real estate website. WordPress does not only make it easy to enter your content. A useful plugin can also assist you with the search engine optimization (SEO) of your posts. The same thing is true for Social Networks. Everything that is new about your business, new products or interesting information can also be interesting to the crowd in Social Networks. Social Networks enable people to connect, follow and bookmark each other and of course, get in contact. Do not miss out on this opportunity for the promotion of your business. If you are looking for ways to make better use of social networks for your real estate business, just contact us for advice. If you know of any general “meeting points” for prospects of your business, do not let the chance of showing your expertise there slide. If allowed on this platform, give people a good chance to contact you by calling to action and telling your URL and/or your contact data in your signature. If there are options for placing a profile, fill it out as thoroughly as possible. Add your photo, if possible. Turn to business owners offering services related to your field, who are not a direct competition. These partnerships can work online, as well as offline: Leave your folders in each others office to hand them out to prospects or exchange links on your websites for link building. Link exchange can attract more visitors to both of your websites and strengthen their validity towards the search engines. Paid advertising (if done properly) does not necessarily have to break your budget, and can still be effective. Reserve a certain amount of your monthly budget for this part of your advertising and seek the help of a professional to make the right decisions on keywords and all other presets. On demand we will be happy to assist you with that. In this article we have only scratched the tip of the iceberg on what you can do on the internet to promote your business. Of course, if you are only a small business owner or even only one person in your business, the measures need to be chosen wisely in order to be able to keep up. After all there is a lot of manual labor involved. We are able to take some of the labor off your shoulders, probably for much less than you think. Just talk to us, we will be happy to figure out the best advertising strategy together with you. Also learn more about having effective online real estate business with your professional website in this essay.